In January I started the Two Term Diploma at Leiths School of Food and Wine. It seems that after 12 years at school, three years at university and six months training to be a journalist, I was back to where I started: at school. But that’s not necessarily a bad thing. I saved up and signed up for the course to gain a solid foundation knowledge about cooking. This, I figured, would help me to improve my writing about food and drink and focus on the finer details. The days speed by when you’re cooking all day and writing all night. I’ve already completed a month on the course – time to share a few of the things I’ve learned so far. The thing that I really worried about before starting the course was being able to cook at speed. At home, I cooked for pleasure and at a leisurely pace – not something chefs have the luxury of doing in the kitchen. In the first few weeks I struggled to finish on time. Then I realised that the reason why the students doing the full Diploma were so good was because they had everything they needed ready and knew what they were doing. When I started doing the same, I got a whole lot quicker. One of the most tedious and time consuming aspects of the course is the time plan, something I haven’t had to do since Food GCSE at school. It’s basically a piece of paper with all your ingredients and instructions on, including what you should be doing when. As annoying as it is to do, it is incredibly useful in helping you to be organised. Of course, it’s no good if you don’t know what’s on it so you need to absorb as much of it as you can. In the kitchen, it should only be a frame of reference rather than something you look at every two minutes. When you cook for yourself, family and friends, flavour is generally more important than presentation. But sometimes even when you put together a considered arrangement on a plate, it somehow doesn’t look like it would in a quality restaurant. Perhaps that’s because the very premise of restaurant food is that it needs to be presentable so from the outset, the food is prepared and cooked in a specific way. For example, the presentation side of fish is always cooked first, the knuckles on poultry are always trimmed, any exposed bone is always scraped clean and so on. Your beautifully presented dish really started with perfect preparation and careful cooking. That said, don’t forget to do any post-processing before you serve it. This one is probably the oldest nut of wisdom in the book but it’s very true. It’s not just about hacking a carrot any old way though, you have to roll-slice it. That is, leaving the tip of the knife on the chopping board and lifting only the heel of the knife so you can push forward and down to cut in a rolling motion. In essence you’re moving the blade through the food rather than straight down which makes chopping a lot easier and cutting yourself much less likely. Admittedly it’s not the most natural movement to start with but with practice it does work. You will need a very sharp knife and chefs’ knives are exceptionally sharp – much more so than regular knives it seems. But don’t fear your knife, you’re more likely to cut yourself while cleaning it. Fish in a Day is the first of Food Safari‘s “field to fork” experiences to arrive in London via Suffolk. Founded in 2009 by Polly Robinson, Food Safari takes people who love food to visit producers and learn more about the ingredients that they cook with. 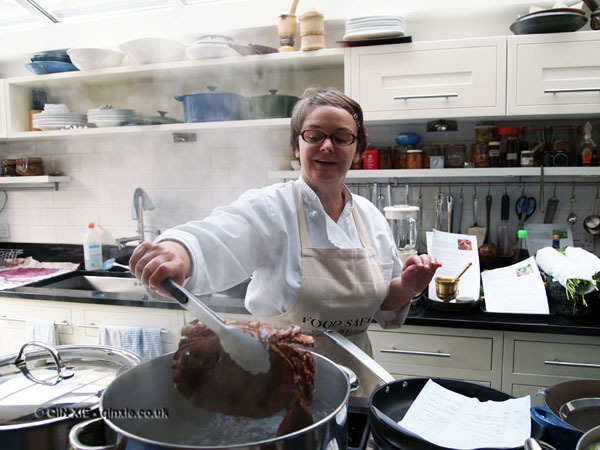 The London version, run in conjunction with Culinary Anthropologist and author of Eat Slow Britain, Anna Colquhoun, works in much the same way except the producers are brought to the course. The class has four key aspects: introductions to producers, preparation of ingredients, cooking the dishes and sampling the results. Sustainability is a big part of this course. All the fish and seafood, with the exception of the live Cornish crabs, were sourced from the Suffolk-based Maximus Sustainable Fish. Robinson and Colquhoun enthusiastically discuss how best to sustainably select and cook your fish over fresh coffee and biscuits before moving on to the practical aspect. Colquhoun explains and demonstrates everything before you begin and there’s a lot to learn. Everyone get hands-on experience in how to fillet and skin round and flat fish, prepare squid, pick crabs, and sort mussels. The most tasking part is perhaps the fish. When it comes down to it though, all you need is a sturdy but flexible fillet knife to follow the skeleton of the fish, producing two fillets from round fish and four from flat. Mackerel, sea bass and lemon sole are used for practice and the fruits of your labour are then used as ingredients for cooking. Working in small groups, we were assigned recipes for bouillabaisse, grilled squid and lemon sole goujons to make from scratch. Alongside the mains, you also learn some classic seafood accompaniments including aioli and charmoula. After finishing six fish and seafood dishes, it’s a relief to be able to finally sit down and enjoy your efforts with a well deserved glass of wine or two. The amount of hands-on experience gained from a Fish in a Day course makes it quite an intensive course but it is not only educational in the culinary sense – it will leave you more culturally and environmentally aware. The course is great for team building but perfect if you want to brush up on some fish and seafood skills, learn to make classic recipes and accompaniments and have some fun along the way.